My super-dooper Husqvarna Diamond sewing machine came with an embroidery unit, which I wasn't particularly interested in but I've played around with from time to time - it's great for making quilt labels. 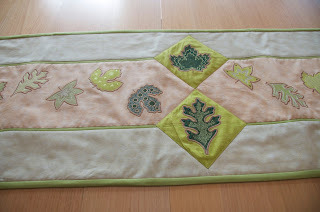 Last year, I decided to explore what I could do with it and bought Sarah Vedeler's A New Leaf design. It works with the Rustling Leaves cutters for the Accuquilt Go Cutter, which I had just bought, so it seemed like a good project to try out. Then my brother and sister-in-law mentioned that they wanted a table runner. I showed them the pattern for A New Leaf, which they liked but they wanted their one to be half as long again. I soon found that there is more to machine embroidery than just hooping up some fabric and watching it stitch out but after making just about every mistake possible, I eventually finished all the stitching and put the runner together. 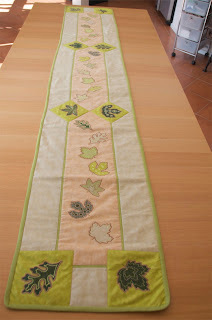 Here it is spread out on my extended dining table - the runner is a bit less than 2.6 metres. A lovely piece and a great way to get to grips with what you can do with the embroidery unit.